My pursuit of life, style, and happiness. Hello there everyone!! I hope you all are bundling up and keeping warm. Do know that although it’s necessary to pile on the layers that doesn’t mean you can’t layer with style. If I’ve learned to do so, you can to. Here’s a recent example of my winter style. 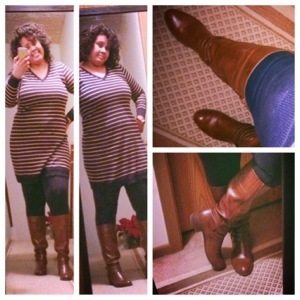 Now everyday basics are the key for any style and for the most part I collect mine from Old Navy. Their items are wearable at any size and are appropriate for any occasion. I recently purchased this v-neck, striped sweater dress in navy. Currently it is on clearance and they are offering and additional amount off clearance items. But you have to hurry because the offer and dress won’t last. 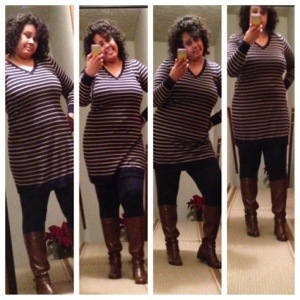 I paired the dress with a basic pair of navy blue leggings that I purchased from Forever 21. I have several pairs of these leggings, that are offered in an assortment of colors, which I find convenient for my everyday style. To complete the look, I zipped up these Unisa Toshio boots I got from DSW. 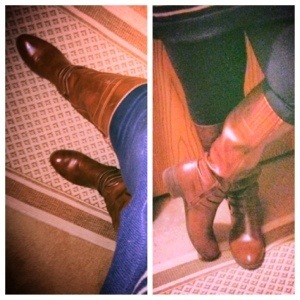 These brown boots have been a complete lifesaver for me this winter. They’ve kept me warm and they go with everything, and yes I pair them with black ensembles, I’ll discuss that in another post. The stretch material is an added benefit for my wide calves as well. Now if you like you can add flair to this look with a wide belt around the waist or a simple necklace. I’m currently working on my accessories skills and when I get it together I’ll share some ideas with you. So that’s it for now. I’ll see you next time. Deuces!! Happy New Years!! Ok, I’m late but it’s the first post of the year and I felt it was fitting. So I’d like to discuss the only signature I have, my hairstyle. 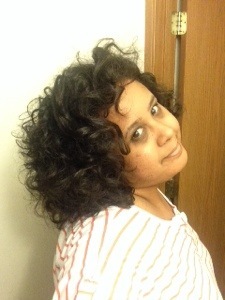 These big beautiful curls were created just over a year ago. From the moment I presented them to the world everyone, including myself, loved them. 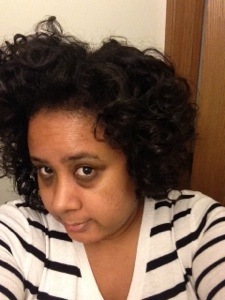 They were fun and cute, they fit my style and most importantly, they protected my hair from excessive heat damage. So let me explain how I create them. To wash my hair I choose to use their Monoi Shampoo and Conditioner. I then follow up with a deep conditioner by using the Monoi Hair Repairing Mask. After rinsing out the mask I follow up with the Black Vanilla Moisturizing Leave-in Conditioner for detangling, the Monoi Repairing Anti-Breakage Spray for protection and I also use the Synergi Thermal Mouse for volume from the local natural salon, Synergi Salon. I then comb through to detangle, let air dry until damp then I divide my hair into four sections and prepare for work. 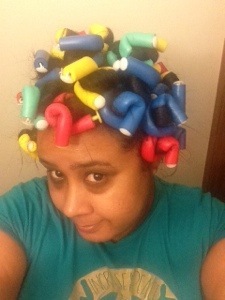 To actually curl the hair, I use Hot Tools Professional Long Spongy Rod Rollers from Ulta and some Hair Balm from Carol’s Daughter for some soft control. 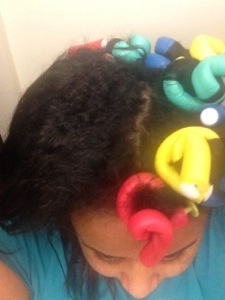 I go through each section to firmly twist and wrap smaller sections around the rods. 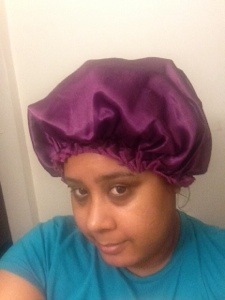 And of course my satin cap. In the morning I unravel each coil and end up with this. 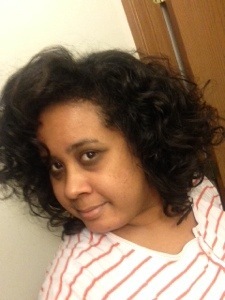 I then use two pumps of Monoi Oil Sacred Strengthening Serum which is also from Carol’s Daughter to fluff out the curls. See, I told you I love their products. 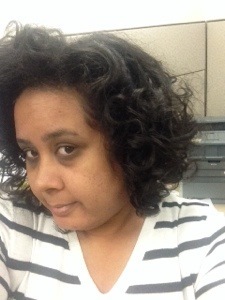 Throughout the day my hair will begin to expand to a larger size but I love the full look. 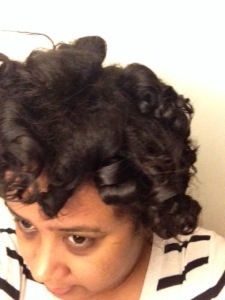 Then at night I’ll comb through the curls again for added fullness. So there it is, my signature which can last up to three to four days. I really do love this style for me and I think I’ll look for new variations to play with. When I figure it all out, I’ll let you all know. Until next time, deuces! !